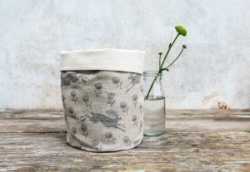 This luxurious linen Bistro aprons is simple and timeless, featuring Sam Wilson's Running Hare repeat pattern adapted from original linoprint. With fully adjustable waist ties. Easy to wear, for a man or woman.